Merry Christmas from the Millennial Homemakers! This year, we’re celebrating by bringing you the Twelve Days of Christmas. 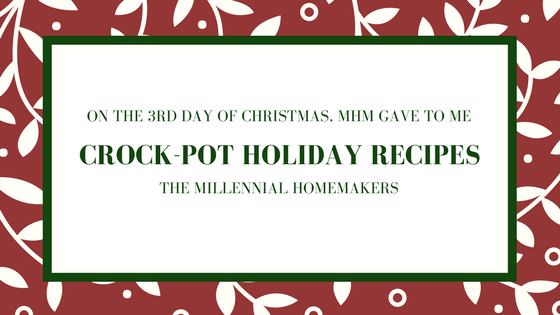 On the third day of Christmas, the Millennial Homemakers give to you - our favorite holiday crock-pot recipes! Add all ingredients to your crockpot. Grease crockpot with softened butter. Whisk eggs and blend in the eggnog and brown sugar. Whisk while pouring in melted butter, then add vanilla. Add bread and stir until all the bread is soaked. Mix in raisins. Pour into crockpot. Cook (covered) on low for 2-3 hours. Right before the pudding is done, prepare the eggnog syrup. Common eggnog and maple syrup in a small saucepan over medium-high heat. Simmer for 5-7 minutes. Remove from heat and stir in butter. Cool slightly, then serve it warm over the bread pudding. Rub the inside of your crockpot with butter. Drizzle with maple syrup, stir to coat well. Cover and cook on high for 30 minutes, uncover and cook on low for 1-½ to 2 hours, stirring every 30 minutes. Sprinkle brown sugar on bottom of your crockpot, then add the ham. Pour pineapple over the ham. Sprinkle with the remainder of your brown sugar. Combine milk chocolate chips, heavy whipping cream and honey in your crockpot. Cook on high for 1 hour. Add white chocolate chips and stir until melted. Add in vanilla. Pour into a 8x8 foil-lined pan and cool for 1-3 hours. ← 2nd Day of Christmas // Christmas China – To Buy or Not to Buy?